“I have it. I have it. And that’s why I’m answering you the way I’m answering. There are three positions where I have three players and there are only two places. 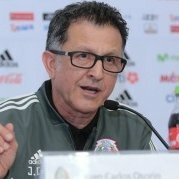 At the end, something will happen that will tell me, ‘This is it.’ The items are: Who can play where, who can play against who and who is in the best possible shape,” said the Mexico coach about the upcoming World Cup selection process that he has in mind.